Beam dynamics involves studying the motion of a great number of charged particles in static or non-static electromagnetic fields. These fields may be external or induced by particle distribution. At high energy, the effect of synchrotron radiation must be considered. Once the transport optics has been defined to meet accelerator or transfer line specifications, many problems must be overcome to guarantee accurate modeling of beam dynamics. Examples on the fundamental level include the following phenomena: interaction with the residual gas, interaction with solid interfaces, the dynamics of ion source plasmas, beam optics in the presence of high-order electromagnetic elements (hexapoles, octupoles), and controlling halo formation and beam losses for the maintenance of future high-power accelerators. Overcoming these problems involves perfecting analytical models and developing numerical methods that exploit available computer resources to the full. Transverse distribution at the final detection plane of the S3 spectrometer used for the Spiral 2 project. The separation of three isotopes of a super-heavy element (Z = 116 and A = 291, 292, 293) can be seen, with five charge states. Each group of marks represents the three isotopes for a given charge state. The calculation is based on S3 geometry with 3D field maps for all elements, including the Mosar magnet. For many years now, the CEA and CNRS have worked together in the field of high-current accelerators. Examples of collaboration in this area include the construction of a low-energy demonstrator, the IPHI high-intensity proton injector, as well as work on a number of projects, such as Spiral 2 at the GANIL facility, which uses a deuteron beam, FAIR at GSI, ESS, and hybrid reactors using protons and, last but not least, the IFMIF-EVEDA project, which calls for a deuteron beam of unprecedented intensity. SACM possesses the expertise required to design and build the reliable, high-performance ion sources needed for these projects. Particle extraction from the source is modeled by calculating the plasma expansion meniscus and beam generation through a multi-electrode extraction system. Map of space charge potential in the low-energy line of the FAIR proton linac. The abscissa z = 0 represents the extraction from the ECR source. The area with no space charge compensation (potential ~ 500V) on the abscissas above 2.2 m is where the beam is injected into the RFQ. The low-energy line of an accelerator is used to transport the beam from the point of extraction from the ion source to its point of optimized injection into the accelerator sections. 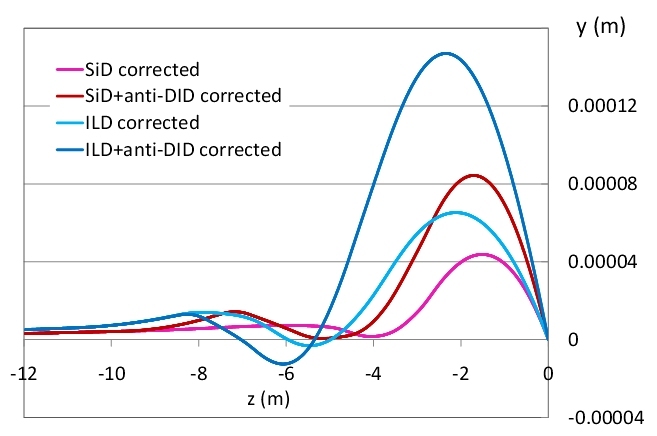 With high-intensity accelerators like the IFMIF or IPHI, the main problem to be overcome is how to transport the beam while limiting loss and emittance degradation. The dynamics of these intense beams is dominated by the nonlinear effects of the space charge field. In a low-energy line, the beam induces the ionization of the residual gas in the vacuum vessel, leading to partial compensation of the space charge. The SolMaxP computer code, developed at SACM, is designed to simulate beam transport under space charge compensation conditions. 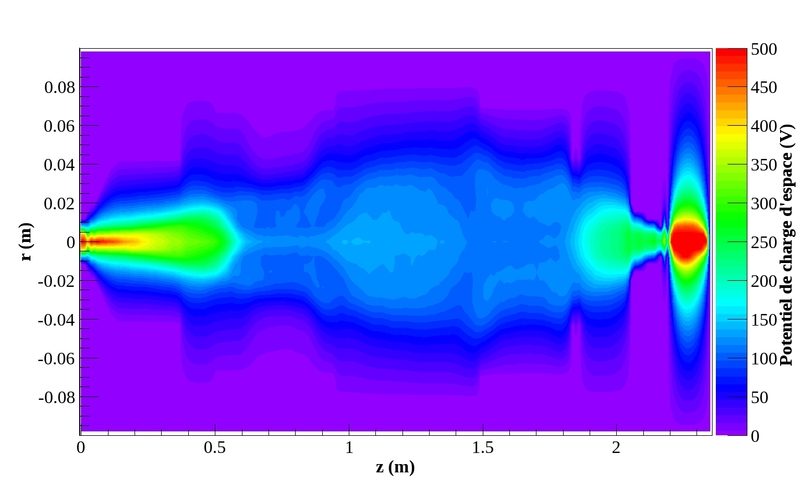 The SolMaxP and TraceWin codes were used together to design and optimize the low-energy line of the IFMIF deuteron accelerator, and to conduct preliminary studies on the low-energy line of the FAIR proton linac. In both cases, the beam is focused by two solenoids, and the beamline dimensions have been optimized (about 2 m) to limit emittance growth. 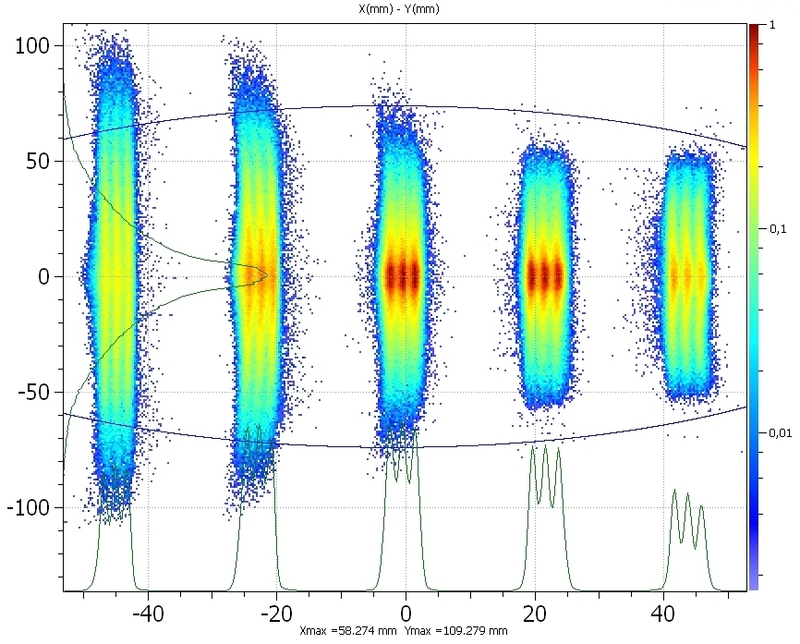 The SolMaxP code was validated based on experimental data obtained by measuring the characteristics of the SILHI source beam (profile, emittance, neutralization rate). Vertical component of the central beam trajectory in the ILC interaction region, after correcting the effects of the solenoid and the anti-DiD (dipole in detector), in the case of the SiD (silicon detector) and ILD (International Large Detector). The interaction point is located at z = 0. Beyond the radiofrequency quadrupole, it is essential to control beam losses in order to avoid any power dissipation in the cryogenic sections, and activation of structures. Beam power in high-intensity machines can reach several megawatts, and the main difficulty is developing extremely precise calculation methods to estimate the probability of very low losses, which can often be well below one watt. SACM has focused on developing simulation codes that are capable of defining the most high-performance accelerators, and on carrying out simulations based on the most realistic description possible of the accelerator, taking into account tuning and construction errors. Reliability studies must also estimate the impact of failure of one or more accelerator components and, of course, consider the corrective action to be taken in such an event. SACM is involved in many projects that call on every aspect of its expertise and skills, the main examples being IFMIF, Beta-beams, Eurotrans, Eurisol, Linac 4, SPL, ESS, Spiral 2, ILC and S3. Since 1995, SACM has developed a series of computer codes for use in beam transport design and simulation. These have been distributed to many French and foreign laboratories since 2000, and are now used in most research on high-intensity accelerators. In addition, experimental comparisons at the SNS in the United States, J-Parc in Japan, and GSI in Germany, have been carried out to verify their predictability. These professional computer codes are now available under a CEA license. A website (http://irfu.cea.fr/Sacm/logiciels/index.php) has also been set up for downloading purposes and for promotion via Internet search engines. The purchase of a user license entitles the licensee to online assistance.